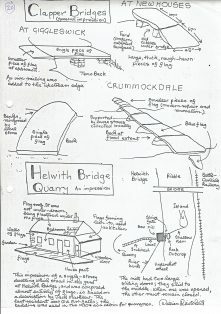 A set of drawings was made by Bill Mitchell of many aspects of the local landscape, its buildings and farming features. The principal theme is that of use of flagstone quarried locally. The drawings are valuable as a record of many items such as cisterns, troughs, pantry shelves, roofing, flooring, barn boskins, beeboles, clapper bridges, and walling with useful dimensions added.